These ID disc reproductions are made from .030 zinc sheet, as were the majority of originals. Note that these are ZINC, and appear silver. Although they appear somewhat yellow in many of the photos, it is simply due to the lighting conditions. They are NOT brass. Two patterns of small disc are offered; both are variations of the pattern 1879. 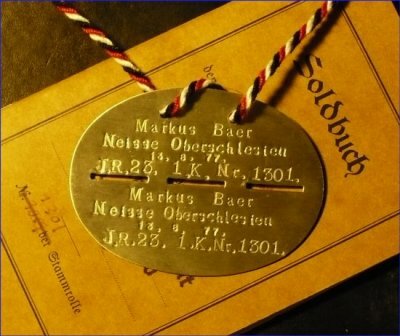 They are the discs that most soldiers in 1914 would have been wearing. They typically have only unit information. Some, particularly for officers, would have name and sometimes rank inscribed. The pattern 1915 was similar to the small disc, but larger, so that more personal information could be included. Name, home town, and date of birth were added. These discs have the widest variation in the way the information was stamped. Similar to the 1915, but with slots punched in it to facilitate breaking the disc in half in the event of a soldier's death. Usually, all information was repeated on each half of the disc. Return to Main Page Email CLANG!